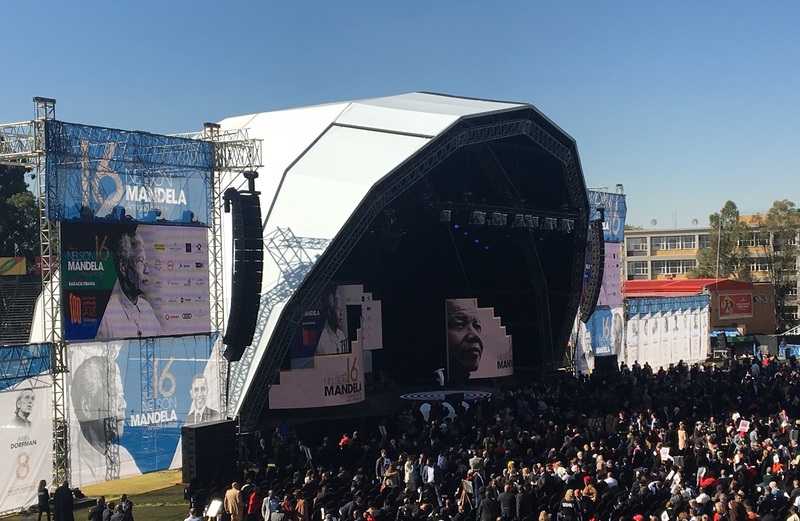 You could hear a pin drop as former US president Barack Obama delivered the 16th annual Nelson Mandela lecture at the Wanderers Stadium on Tuesday. It could well have been because of the biting cold, but then it could have been because the audience sat enraptured at the charismatic killer who is one of the most gifted orators. SHAAZIA EBRAHIM and FATIMA MOOSA reflect on the event and the lecture. We arrived at the Wanderers Stadium two full hours ahead of when the event was scheduled to start. Begrudgingly, we will admit that despite our disillusionment with the rainbowist obsession with Nelson Mandela and what we know about Obama as a capitalist murdering imperialist, we were eagerly awaiting the event. We stood in line for security checks for over an hour with a certain mini-Mandela (read Mmusi Maimane) lining up as well. Then we sat with the thousands of other undisputedly middle class attendees, from the corporates to the ex-Model C schoolchildren and the media, awaiting Obama. And around us, we could feel the anticipation building. The speakers at the lecture included President Cyril Ramaphosa, Nelson Mandela Foundation (NMF) chief executive Sello Hatang, NMF chairman Njabulo Ndebele, Graca Machel and of course Obama. From the beginning all their speeches were highly politicised. They used their speeches to shade former president Jacob Zuma and current US president Donald Trump. Both are controversial leaders, there is no disputing that. Yet, they are easy targets. You don’t have to search deeply to find something problematic about the two. With Zuma, itâ€™s his relationship with the Guptas, the corruption, the spy tapes and the list goes on. The same with Trump. It makes them easy to criticise. Then we get figures like Nelson Mandela and Barack Obama: leaders viewed through rose-tinted glasses. They are similar (as was mentioned during the lecture): the first black presidents of their countries and Nobel Peace Prize winners. They might have been revolutionary at a point, but that isnâ€™t their only legacy. It is far more than that and if we want to truly acknowledge the leaderâ€™s legacies, we need to balance the narratives. Listening to the glowing tributes being paid to Mandela and Obama and the shade being thrown at Zuma and Trump raises questions about when we speak up to power. Speaking truth to power should be about questioning it regardless of who is its figurehead. Itâ€™s fine to get excited to see Obama and hear him talk about Mandelaâ€™s legacy. But we need to get serious as well. We need to interrogate what Obama stood for as the head of the US military machine and what Mandela did or didnâ€™t do at that pivotal moment of our democracy. We need to stop making celebrities out of politicians and leaders. More than that we need to stop making gods out of men. Leaders and politicians are chosen by the people to lead them. They are given a mandate by the people which they need to fulfil. This means they need to be questioned and held to account equally; whether itâ€™s Trump, Obama, Zuma, Ramaphosa or Mandela. Listening to Obama speak was interesting – he knows how to play a crowd. Obama is charming, charismatic, dignified, and refined. He equally spouted history, politics and anecdotes about his personal life to remind us that he is just like us, human. It is easy to forget that he is a warmongering human rights abuser when the air of celebrity shrouds him. Obama has that iconic voice, he has that iconic smile that has been plastered on every newspaper and every TV screen for the past decade. Yet, his actual speech was nothing special. He might have smiled and joked but his speech didnâ€™t speak to South Africa. He made vague references to problems that face South Africa and the US. We know the speech was screened around the world and that was probably the reason it was more general. It felt unprepared and written by someone who does not understand the dynamics of South Africa. The country is holding hearings about the land and amending the constitution. That is the most topical thing that is happening and yet there was no mention of Mandela and how he viewed the land question. And if you want to say Obama doesnâ€™t have the knowledge to discuss that, it just proves the point why he should not have given the speech. The biggest joke of Obamaâ€™s speech was when he said we needed an â€œinclusive capitalismâ€ as if the very premise of capitalism does not create an exclusive rich and gaping inequality. The problem with liberals like Obama is that they think we can just tweak the system: less corruption, more giving, different leaders and everything will be better. As if the centuries of capitalist exploitation have not created the world in which 1% of the world owns 82% of its wealth. Then there was his appeal to young people. â€œTo the young people out there, you must keep believing, keep marching, keep building, and keep raising your voice,â€ said Obama in his speech. A great deal of the focus seemed to be on the role that the youth need to play in picking up the baton and continuing the legacy of Mandela (and Obama to a lesser degree). It was a call for young people to forge a new path, away from the past. Yet, the future cannot be reached as long as the past has not been addressed. It is this that led to movements like Rhodes Must Fall and Fees Must Fall. It was young people standing and saying that to move forward, we need to address the past inequalities and colonial histories that continue to impact on the experiences and opportunities of young people. It is disingenuous to have conversations around forgetting the past and moving on. The worst is the narrative that says that because young people were not present at those moments in history, they donâ€™t have the right to criticise it. Yet, it is young people and generations that follow who have to overcome those histories. They should have the right to call it out and create new ways of thinking. The youth has been contesting the legacies of both Mandela and Obama. The youth have protested the so-called rainbow nation and the youth have protested Obamaâ€™s foreign policy. But not once did any of the speakers address contesting legacies. When the youth contest these legacies, they are told to not focus their energy on that. They are told there are more useful pursuits which need their time. They are told to follow an old way to fight. And yet we are told to forge our own way. It seems the â€œyouthâ€ are only told to raise their voices when it fits in with the agenda. When it is challenging specific people, and not the actual exploitative capitalist, liberal democratic system. Itâ€™s safe to say that we left the stadium disappointed, but somehow not at all surprised. Weâ€™ve said it before but weâ€™ll say it again, we need to stop hero worshipping men and have frank discussions about their fallibility and failings. This goes for Mandela, and especially for Obama. No US President can be a hero to us. You can read Obamaâ€™s full speech here. Quote: “Leaders and politicians are chosen by the people to lead them.” I’m afraid that only happens in the liberal democracies that you seem to hate so much. I can guarantee you that the leaders of the communist dictatorship that you seem so determined to foist on us won’t be chosen by the people. History also proves that the people who write articles critical of its heroes will certainly end up being told to “Go Gulag” by whichever tin pot dictator the party decides to put in charge so be careful what you wish for! Capitalism in its current form might be broken, but at least it doesn’t oppress people the way communism did. Obama is right, capitalism is fixable. Proper enforcement of anti trust legislation and the prevention of lobbying by business are the 2 most important requirements. Once business loses its ability to influence politicians then proper laws can be implemented to prevent tax dodging and uncompetitive business practices. If you think communism is such a great idea you need to ask yourself why its subjects were imprisoned behind walls and minefields in East Germany? The answer is that a belly full of bland slop and the guarantee of a boring job are no substitute for freedom! You have to have lived in an actual communist country to understand the awful level of oppression and utter fear we lived through. These kids are talking out of their bums, trying to sound provocative and revolutionary. Ask an actual Cuban person how nice communism was. Or someone from the Eastern Block. You hate him because of misplaced religious solidarity with his enemies in the War on Terror. Next.